Every day My Sardinian Life receives blog hits from people around the world searching for the cost of living in Sardinia, Italy. Yesterday afternoon I did a little shopping and thought it would be fun to post my shopping receipts to help those people who are continually searching for the cost of things in Sardinia. Here’s a quick run down of items purchased. Reparto 5 – Ice cream .28¢ (The price of the ice cream was €2,88. Seems she forgot to add the last eight. Generally this happens the other way around, they add extra items to the bill when you are not looking. It’s happened to me a billion times. Watch what they are passing through and watch the screen). On average, we spend €100 a week in groceries for two people. A liter of gas in Sardinia costs = €1,85 or $2.36 Canadian dollars (this I know because I can see the gas prices from my living room window). Internet – we pay €19,00 a month for 470MB of internet time a day! A rip-off if you ask me. We used to pay the same amount but with 10 HOURS of internet a day! Cell Phone – we use pay as you go. €15 will last us a month. But we aren’t big telephone chatterers. Electric bill – arrives every other month and we generally pay more in the winter months than summer months. In the winter the average bill is €60,00 and in the summer half that. Water bill – hasn’t come in over four years! You read that right, four years! We are not the only one who has this problem with Italy’s water billing. Our neighbours received theirs after five years and had to pay €600!! 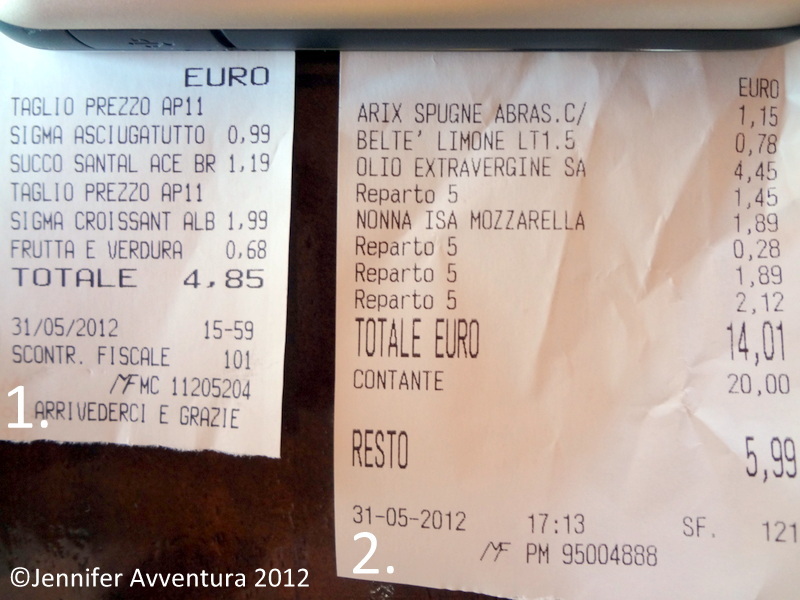 Eating Out – Two pizza’s in the local pizza joint start at €5,00 – €12,00. Then you have your cover charge or coperto which is €2,50 per person (every restaurant has this cover charge, consider it your tip to the restaurant). One liter of wine €8,00. Dessert €4,00 – €10,00. Bottled water €2,00. Coffee €2,00. Mirto, Sambuca or Limoncello €4,00. A grand total for two people: €47,00! Click the following link to read the Cost of Living 2013 Report! How does this fit in with your weekly buying schedule? I think I’m going to take your basket and do a comparison… will you do a 2103 update? I haven’t thought of it – maybe I will. Thanks! Looking forward to reading yours. Great idea! Although, I never buy milk, we don’t like it. What could I use instead? hmm. Definitely way, way cheaper than Moscow, and the food quality cant compare. Tho I think I get a better deal on the Internet. Hi, we have just come back from visiting family in Sardegna (Olbia) my partners father is from Sardegna and really want to take the big step in moving there when our youngest has finished school, in 3 years, but we r concerned about the 70 percent income tax you have to pay. I have searched on the web and cant find any info about when this started whys and wherefores and if and when it will be reduced, do you have any info you can pass on we would be very greatfull. Just wondering what kind of visa did you apply for to live in sardinia? I hit the love jackpot. Aha! That’s lovely! So you’re on a spouse visa I’m guessing? Also we are driving out with our car, is there any regulations in bringing our car into Sardinia? also do you know anything about bringing our beloved pet cat Poppy, I have been in touch with Defra but just wondered if you have anything informative on this. No, Im not getting fed up, I’m glad this forum is helping you. A glass of local wine in a restaurant is cheap, probably too cheap. You can get it for around 2Euro and a beer for about the same. Not sure about bringing a car into Sardinia and the regulations as I don’t drive. Thanks Jennifer, you are such a help, counting down the days now till we come out, and trying to learn more Italian. I suppose you couldn’t tell me what the electric voltage is out in Sardinia, I have some good electrical products, that I really would like to bring, if only I knew if they would work? Aren’t all the foreign women in Italy?? None of them would be able to be here if it wasn’t for the Italian ‘boyfriend’ or spouse…just read all their blogs – you will see it. Well, isn’t that a lovely observation. Sometimes, love conquers all. Complements on site, Well done! We are planning a trip over in the spring to see Sardinia for a few weeks to see where we might relocate. We will alway run our American business for income but would like to live in a beautiful place , take in another culture, and with much less population than here in New Jersey. Sardinia seems to be that place. Also what type of water do they have? ( City,or well ) and is there low water pressure? I am the wrong person to be asking about home property tax per year. I’m sure it’s expensive. Water is run by each town and the pressure is decent. They do turn off the water once in awhile without notice – sometimes for days, so stock up on well water which you can find around town. Do you speak Italian? And thank you for liking my site, all the best! Hi Tamara, Jane here, thanks for the help on buying used furniture, could you also tell me if you use Gas Bottles for cooking and water heating. When we lived in Andalucia ( 20mins from Antequera ) if you know that area, it was all gas bottles no mains. If it is the same how much are gas bottles these days. We have sold our cottage, and in approx. 8 weeks are moving out to Sardinia to buy a renovation project. We are looking around Bosa area and have seen a great property near Sedilo also, what do you think of these areas? It depends where you live in Sardinia….. I live in Nuoro and I am connected to a gas line, but some people are not…… if u live in a village you will certainly have to use gas bottles, unless u want to heat water and cook with electricity, but then it will be more expensive…. gas bottles have different prices according to where they are sold, for example a bottle that costs 32 euros in Nuoro, costs 26 in Santa Lucia di Siniscola, only 50 km away…. we use bottles in our beach home in Santa Lucia di Siniscola and one usually lasts a month, depending on how many hot showers we take….. in the summer it can last longer……. I am sorry but |I cannot help you with your lamps, I have no idea if they work here. Bosa or Sedilo are quite different places. Bosa is on the coast, so relatively touristy, therefore more open and more lively, Sedilo is SARDINIA SARDINIA, inside the Barbagia area though at the periphery, it can be interesting but certainly not for everybody……. it’s pretty useless to ask how much do things cost in Sardinia. All depends where and what kind of service you are expecting, plus the quality of the product, just to give you an example, you can buy half a kg of strawberries for 1.20 euros in a supermarket on certain days when there are special offers, or you can find the same strawberries (industrial quality) for 1.90 on normal days, but if you want the real sardinian strawberries from fields, jucy and tasty than you have to spend something over 3.00 euros for half a kg. I usually pay 1.20 for an ordinary ice/cream for my daughter in the pub in santa lucia di siniscola where we have our beach home, but I paid 2.60 for the same brand once I went to Murta Maria, a somewhat ‘better’ place up north, near Olbia, but the lady who waited on us was wearing a uniform, smiling all the time and the place was tastefully decorated, so it all depends what your requirements are………. But the real good food is expensive, or donated by friends from their self/made supplies, otherwise it s the usual supermarket quality (yak) that is about the same in the west. The price of the ice cream was €2,88. Seems she forgot to add the last eight. Generally this happens the other way around, they add extra items to the bill when you are not looking. It’s happened to me a billion times. Watch what they are passing through and watch the screen). HEY, jENNIFER aVVENTURA….io ci sono nata e ci ho vissuto in Sardegna, e te lo protrebbe confermare qualsiasi sardo che accidentalmente e solo in questo caso…abbia letto il tuo blog. Non penso proprio che ti sia successo così tante volte e poi pensi che il paese da dove provieni sia lindo di colpe? Se vuoi veramente far apprezzare un paese che non sia il tuo è di regola parlare delle sue virtù piuttosto che delle negatività. Rispetta e non dare consigli come se il resto del mondo non lo meriti ( a parte il tuo paese). Io sono sarda e me ne vanto e il mio consiglio è questo: sappiate cogliere con grande sensibilità tutto ciò che un paese straniero ha da offrire, non sottovalutate nulla perchè anche l’angolo più sperduto e povero potrebbe farvi sognare e riscoprire ciò che avete perso. Thank you for your kind comment. Do not underestimate me nor my country of origins. If this is the only negative you have taken out of my blog then so be it – in the truth of the matter, being overcharged for something has happened to me – several times, one too many times. Do you watch everything that is scanned though when you go to the supermarket? I have written countless posts on how spellbinding your island is and I have nothing against the people or corporations within the town I live in, in Sardinia. I have written many times about the lovely virtues Sardinia has to offer – and within this one post you find negativity because I spoke the truth? You speak of guilt – who is to blame when you are obviously overcharged for something, or something has been scanned TWICE? Who is the guilty person then? Should we as humankind just shut our mouths and allow this theft? I think not. I have never once compared Canada to Sardinia – in this case you can’t; it’s like comparing apples to oranges or circles to boxes, it doesn’t work. You are correct with one statement – do not underestimate anything. Even the people that scan your groceries – in Canada, England, Australia and even Sardinia, Italy. There are con-artists everywhere. We are doing a really tight comparative look at cost of living in UK and Italy with Tasmania. We are considering relocating (my husband is UK citizen and I am italian citizen by my father’s birth). When we relocate we will bring the same income as we have a business that exists on the net so we do not have to consider an italian/uk income. We are a family of 4 (to small children). If anyone is interested in offering me an italian comparison, based on the above list of mind boggling, kind of boring, but really interesting details for Bologna, Genova, Firenze or an even more detailed Sardegna version ?? That would be brilliant! Everything is very pricey here in Hawaii. On our island, Oahu, to rent a one-bedroom apartment costs roughly US$1,500/month. My friend paid $2,400/month for her ordinary 2-bedroom apartment. And to buy a one- or two-bedroom apt runs $275,000 – $500,000 or more, if it’s upscale. You can find rents for less, but I’m not sure you would want to live there. Our electricity is $100/month and we are very frugal with electric usage. That’s with no heating (of course) and no air conditioning, and I rarely use the oven. Wow, that’s some serious high prices for rent. But I imagine the view is beautiful! If only that were so, Jennifer. Most are city views where you can see other hi-rise and low-rise buildings. The ones with ocean views cost much, much more. The higher you go, the more it costs. I’m on the 4th floor, and my view is mostly buildings. In Honolulu, they paved Paradise 😦 Luckily, the ocean and mountains are never far away and we can escape the city from time to time. Just found this post, All euros I pay 1.87 for petrol, the next important item as far as I am concerned is wine and I pay 3.50 a litre but boy is it good. Gas for the house is a nightmare, when we first moved to Italy we rented a small house that had one bedroom, kitchen, bathroom and lounge area. The gas bill for December & January was 972.00 euros!!! with 8 days to pay or risk a penalty. We installed a small wood burning cooker in the lounge to heat downstairs and to reduce the bills for the following months. That’s an insane gas bill! Did they make a mistake? Seems so. I agree with you that wine is one of the most important items in the weekly shopping. I buy 2 liters of the local stuff and it costs 5 euro. No not at all, I checked the readings, we even asked our landlady who was an accountant check it. Hey Jennifer, After reading your shopping post then Algarve’s I thought I should do one too 😉 Here is my grocery shopping this week in Shanghai. Pretty much the same here in Piemonte (north of Italy)…only my water bill gets here on time 😉 and my electric bill is soooooo much more :(. I know in the Netherlands the costs are highr! That is crazy about the water bill! Here in Shanghai some things are the same or cheaper than home which I found a ‘good deal’. But everything is a matter of perspective… my co-teacher explained for me it is cheap, but I am on a western salary not a local one. (they can make 1000-5000 RMB a month – $150-750) Things have really jumped in price here over the last 2 years. 1000 RMB ($150) used to last us 7-10 days and that was for eating out (cheaper than cooking at home and so many buy one get one deals on different nights) and groceries. Now we are lucky if that lasts us 4-5 days. Getting tailor made clothes is still cheap though 😉 It is the utilities, groceries and daily living that has jumped. A new tax is coming for us expats soon too, but supposedly we can claim it back if we leave. This is fascinating – what a great idea for a post! I might take a page from ferragudofan and do the same for here in Rapallo. One thing that’s not on your list is all the taxes – auto, refuse, the new IMU and IVIE – yikes. I never have gotten questions about cost of living for Rapallo; I think we’re a bit more expensive than you are, it’s certainly more expensive here than in the entroterra. We get our water bill pretty regularly now (2 x year) but it’s frequently estimated. Once we had a perdita and never knew it for a year and a half until we got a water bill for 2,600. We fought and fought with them, and they finally reduced it by 500 because they had sent us an estimated bill AFTER they had made a reading. But still, a 2,100 bill was a most unpleasant surprise, especially since it’s usually about 30. Now I take a photo of the meter every month and keep track so I’ll know if there’s another perdita. I just loved the idea for this post… good fun. Oh yes, please write a post about the cost of living in Rapallo, I’d be very interested in reading it. I did leave out all the unpleasant Italian taxes as my husband takes care of all that. And I don’t drive a car for car insurance I have no idea what he pays … a little ignorant I am on these. 😉 Oops! 🙂 That’s a crazy water bill and I’m shocked that they reduced it for you. My husband has been fighting for months with his insurance (car) about an irregular price they charged him, they don’t budge on it!! here’s my post with receipts – we’re quite similar in prices for a lot of items I think? We are with the exception of the 6 eggs! great post! hope you don’t mind if I use your idea on my blog too … then we can compare prices! I like the idea of not having had a bill for 4 years … but I am sure it will catch up at some point?! Our internet IS expensive. It was ok-ish when we had 10hrs a day, but they changed their plans. It’s all about the rich taking from the poor here. Our electric is so cheap because I’m very careful with what we use. Lights only come on if necessary, the oven only gets used in the winter as it helps heat the house. Yours is very expensive! yikes! The cost of living here in Sri Lanka is blowing out like mad since the IMF insisted the Rupee be allowed to float. Since almost everything except food is imported, you can imagine! I’ve been wanting to do a comparison – seems now’s the time! That would be great to read how prices compare in Sri Lanka, give it a go! Good post, definitely more expensive in London but I may price it out to see how it compares. I should have waited to write the post when I did a better shopping day. Maybe Ill do another one when we have to pick up all the household goods. GREAT idea for a post! Sounds a lot less expensive than here in the US–at least for food. What about the cost of housing? To buy or rent a house? Plus all the bills that go with it? It really depends on the area you are looking into and the time of year. All prices on rentals skyrocket in July & August. You can look for spend anywhere from 300-600 Euro a month for rent. Do you have an idea whereabouts on the island you will settle? Are you planning on moving here forever or just a few months? Ciao Jennifer, we’ve been looking at Alghero, Oristano, Bosa and the like, we really need long term as this is a permanent move, we lived in Menorca for awhile but the options for aquaculture are non existent as it’s a bio reserve, we’re pretty flexible really, just so much to find out primary schools, health etc! thanks for coming back to me so quickly. Great blog by the way, love this section on costs of living, as you can’t live on thin air and beautiful scenery! I just did a little update to the post. I added in cellphone, internet and other household bills that I could think of. I’ve come back. Thanks for the addition. Italy is actually one of the places I would love to live. I know there are parts of the country where housing is quite affordable. Ultimately, I’m thinking of an affordable place I could go and spend a year (at least) writing. Don’t know if or when that might ever happen. Thank you so much for the info on furniture prices and used furniture in Sardinia. Things are moving fast now and should be moving out soon. Will be printing off your notes on where to look for used or traditional Sardinian style furniture. Greatly appreciated, also to Jennifer for replying to my post. Best Regards Jane. PS. THIS IS A GREAT SITE, REALLY HELPING ME OUT. the cost of housing in Sardinia varies, according to wether it s in the capital city with a university and airport and harbour (Cagliari), rapidly expanding coastal town of Olbia (harbour and airport), inner district city like Nuoro, or villages. And of course according to qualities and amenities. I forgot to add that we have a year medical bill of about 800 euros. Although in Italy most cares are provided freely by the national health insurance, if your income is only a little above real poor, you must pay a contribution for services (blood tests, urine, etc, plus specialist doctors, some medicines), but not for hospital care. I hope this helps people who are planning to move to sardinia. 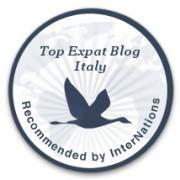 I am an expat too here although I am Italian because I came to live in sardinia from Tuscany about 30 years ago…… I am thrilled about the fact that other people are planning to move to sardinia….. The prices aren’t that different than here in the in the San Francisco Bay Area (California), though the bananas and apples are a little over the top price wise. The bananas and apples are imported to I imagine the price hike for those. I usually try to buy only local produce but there are no banana trees in Sardinia and the apple trees are just beginning to bud. I hope I can help you out. Second hand shops in Sardinia do not exist. Well, not to my knowledge anyway and trust me, I’ve looked. Italians in general keep everything for years, for eons, passing it down to further generations. Everything in Sardinia is expensive so buying new furniture would be too, and probably more expensive in central Sardinia because of transportation costs. I do not know an ‘average price’ for new furniture. If you need any more help, just let me know. Good luck on your move and have fun. you can find some second hand furniture in Sardinia, the problem is, is it good quality or does it correspond to your taste… anyway try the site subito.it , then go to sardinia, then province of cagliari (that s where most second hand stuff is traded but you can also try with Sassari or Olbia), then from the menu choose ‘mobili, arredamento’ or ‘casalinghi’ and you ll see plenty of second hand furniture and home appliances that are offered. however a medium quality couch ranges from 250 to 600 euros.